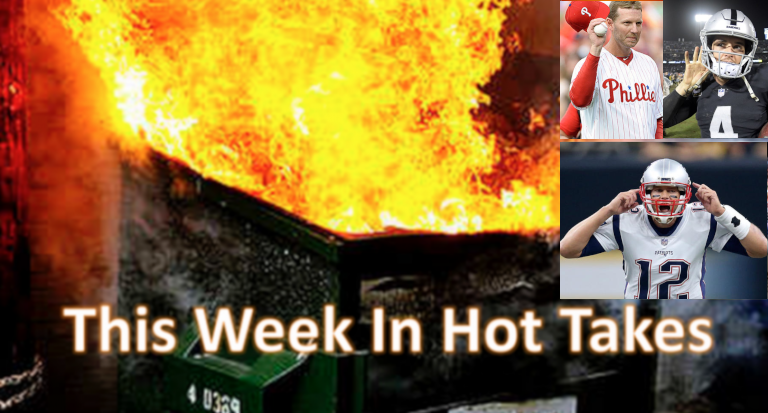 This Week In Hot Takes: Rob Parker says Tom Brady "will become Lance Armstrong without the bike"
"I still believe that when it's all said and done, and that disgruntled person who wasn't taken care of comes out and writes that book and lays it all out on the table, that Tom Brady will be looked at the same light as Lance Armstrong. He'll be Lance Armstrong without the bicycle." Welcome to another edition of This Week In Hot Takes. This time around, we’re breaking down the hottest takes from sports media members from Jan. 18-24. I'm not saying Juan Pierre is a Hall of Famer. But he deserved better than a goose egg. He had 2,217 hits – 30 less than Edgar Martinez – and 614 stolen bases — 565 more than Edgar. First, citing stolen bases here is particularly crazy, as no one was asking Martinez to steal a lot of bases. Yes, Pierre provided some value there that Martinez didn’t, but there are a whole lot of Hall of Famers who never stole many bases. But beyond that, the hits comparison is also funny; it’s not even one that Pierre wins, and it’s not one where he’s even really all that close (especially considering that it took him 312 more at-bats to come up 30 hits behind Martinez), but he’s closer there than he is in most other offensive metrics. Martinez had 514 doubles, 15 triples and 309 home runs in those hits, giving him a career slugging percentage of .515. Pierre? 255, 94 and 18, for a slugging percentage of .361. So he beat Martinez in triples, but his hits produced way less bases overall. Awaiting the 2019 Hall of Fame results, all indications are that Rivera, the former Yankee star closer, will be the first unanimous choice in history. Whether the vote is actually unanimous or just very close really isn’t relevant – such an overwhelming vote for a part-time player and hyper-specialist is enough to show how out of whack the praise can get for a limited player witch such minimal impact on winning games. The even less-deserving Trevor Hoffman was elected last year, though his 79.9% vote magin wasn’t as overwhelming as Rivera’s will undoubtedly be. It should be obvious that all closers are overrated. Yes, in his limited way, Rivera was great at what he did. And he did it for a long time, giving him a leg up on other top closers who typically had shorter shelf lives. The cut fastball that he unveiled in short bursts (2-3 times a week), the one that flummoxed hitters who knew it was coming, was enough to put up great numbers one inning at a time. But it wasn’t enough to utilize him for 200 innings a season (a longstanding rule in sports, you may have noticed, is that the better you are, the more you play). A part-time offensive player who hits .300 and pops 10 homers in 150 at-bats isn’t going to the Hall of Fame, because no one assumes he’d produce at the same level for 500 at-bats. So why genuflect to a 70-ininng pitcher? Aside from a handful of (mostly bad) starts very early in his career, did Rivera ever have to face the same batter twice in a game? Some of the points made complaining about Rivera being the first unanimous selection are fair; given his role, he did produce less total wins above replacement than many other Hall of Famers. But the unanimous selection is more about the voters themselves; past Baseball Hall of Fame voters have fallen all over themselves to deny obviously-deserving players unanimity, and that didn’t happen this year, with one voter even changing his mind to support Rivera. The other element here is that while baseball writers can argue almost anything, they almost universally recognize how much Rivera stood out at his position. Hheck, even Salfino thinks he deserved HOF election. But some baseball writers invariably find reasons not to vote for other players with more WAR, preferring different players at their position. And criticizing this for being unanimous is silly; so some voter who knew Rivera was a Hall of Famer should have not voted for him just to preserve a weird tidbit of history? That doesn’t mean it’s necessarily right that Rivera was the first here, but the outrage about it seems overblown. There’s a legitimate way to criticize Rivera being the first unanimous selection, but the way these two guys did it was pretty over-the-top. But both of them missed the point. Yes, it may be Kellerman’s job to tell you what he thinks (more specifically, his role on First Take appears to be to tell you what he thinks in a way that’s at least somewhat in opposition to whatever Smith’s take of the day is, and to do so in a provocative way that fits with the show), but he could have easily made the case for the Raiders to draft Murray without tossing out baseless insults like suggesting that Carr quit on his team (which is what Carr is really upset about here). And both Smith and Kellerman are trying to argue that Kellerman didn’t call Carr a quitter, but said he looked like he quit, but that’s a distinction without a difference. Kellerman attacked Carr’s character and effort without providing any evidence for that, and both he and Smith then got mad that Carr fired back. And that’s pretty hot takey. 2. Bob Ford argues that Roy Halladay should wear a Phillies hat in the Hall of Fame because…PLAYOFFS!!!1111? What the Phillies gave Halladay, however, was the thing that mattered the most to him. They gave him the postseason. They gave him the crucible where his beliefs about himself would be put to the greatest test. Look, first off, this is a dumb thing for anyone on any side to argue. Which cap Halladay’s Hall of Fame bust wears doesn’t alter one stat of his career, or one memory of him, and the arguments about this just go to illustrate how these caps are silly anyway (and why most Halls of Fame don’t assign players to one specific team). And that goes for the Jays’ fans who bring up “But he said in a Toronto appearance in 2016 that he wanted to go in as a Blue Jay!” That’s at least a somewhat better argument than Ford’s making, but it’s notable that people do change their minds, and that you usually say good things about a city when you’re there. And that still comes down to “I, fan, know Roy Halladay’s wishes better than his family.” But Ford’s argument is like three levels worse than that; “having been around him” as a sportswriter means that you think you can know what he wanted better than his wife, and know that all that “mattered the most to him” was the postseason”? That’s incredibly insensitive, and very dumb. That’s all a hell of a stretch. Yes, the Patriots got into some trouble over Spygate and Deflategate (although the latter remains much more controversial, and many argue that it was an overreach by the NFL), but implying that that makes Brady “Lance Armstrong without the bicycle” is a massive jump. But when you’re Rob Parker, you’re always searching for the hottest possible take on anything. And he found it this week.